Find out when your Steinway piano was built. To find the serial number of your Steinway piano, look for a number (most likely between four and six digits in length) located on the lower part of the piano's cast-iron plate by the tuning pins. It should be easily visible from inside the piano. 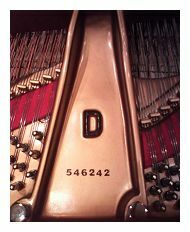 Steinway's model numbers are actually a part of the cast-iron plate, but each piano's unique serial number is stamped onto the plate. Because of this, sometimes the serial number, especially on older, rebuilt pianos, gets painted over or otherwise removed. If this is the case with your piano, you might be able to find the serial number stamped onto the front of the action or stamped on the underside of the piano close to where the pedals are attached to the case. No two Steinway pianos have the same serial number. Each number assigned designates an individual to be loved and cherished for generations to come.